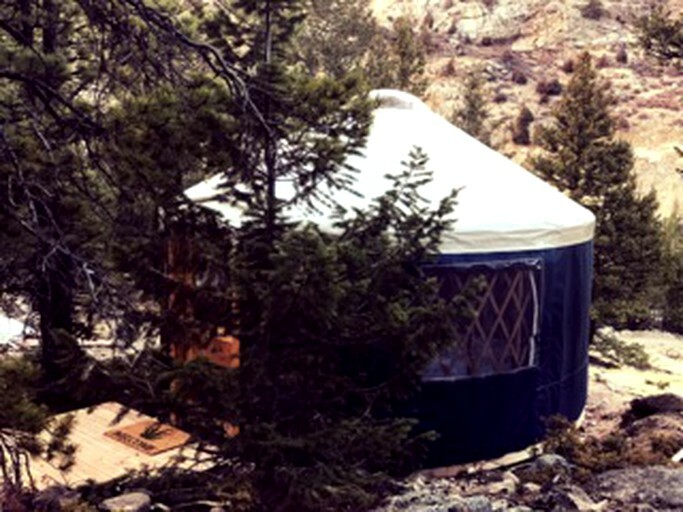 This unique yurt rental is located in Lawson, Colorado, and can accommodate six guests. The living area is open plan and there is a shared bathroom. 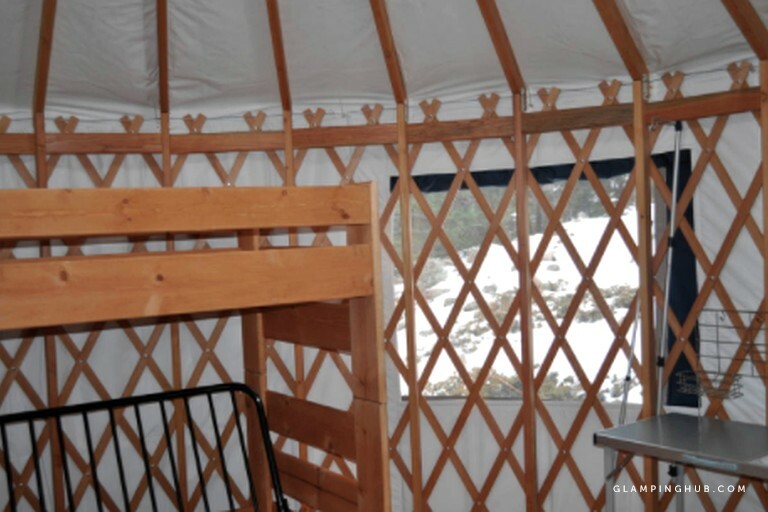 In the yurt, there are bunk beds, a cozy sofa, a heater, and a coffee table. A scenic sky window lets in sun during the day and offers star views at night. In the shared bathhouse, guests will find three toilets, three showers, and a large wash sink. Linens and towels are provided. 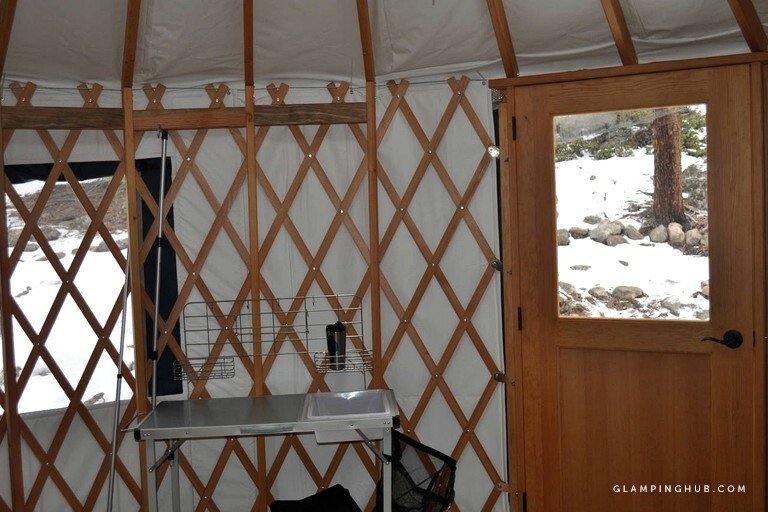 The property boasts cabin and yurts for a unique glamping experience. Each charming cabin comes with a television, a private patio, and a barbecue. The yurts are kept cozy and warm in the winter. The property has a variety of activities such as challenge courses, a bungee trampoline, a climbing wall, a mechanical bull, disc golf, rafting, and Water Walkerz. Activities are seasonal and on a time sensitive schedule. In addition, all activities are an additional cost. Guests who are interested in any of these activities should inquire with the hosts for more information. In the winter, guests will receive transport to nearby ski resorts, along with rides to and from downtown Denver. Guests will enjoy their pick of outdoor adventures without having to leave the property. There are obstacle courses, where glampers can test their skills, the bungee trampoline provides heart-pounding fun, and glampers can roll down a hill in a giant ball, or walk on water with Water Walkerz. A local climbing wall provides wonderful exercise, while the mechanical bull is just plain fun. Whitewater rafting is a wonderful way to get out on Clear Creek and kayaking and canoeing are available, as well. Hiking trails run all through the gorgeous forest that surrounds the property. There are a variety of skiing resorts nearby, where guests can hit the slopes and go tubing. For some city touring, downtown Denver is under an hour's drive away.